How San Francisco’s ultimate power tower became “a modern-day La Brea tar pit” and, potentially, the city’s costliest real estate battle. Jerry and Pat Dodson’s problems with Millennium Tower—not of the sinking-into-the-earth sort, but of the social variety—started with a walk around the block. It was August 1, the day the news hit the front page of the Chronicle that the 58-story luxury condo building that the Dodsons called home was settling and tilting. Like many of her neighbors, Pat had only learned in May that the Millennium was in a different state than when she’d bought her unit back in 2009 for $2.1 million—namely 16 inches lower and listing several inches to the northwest. Suddenly, the warped, cracking sidewalk at the monolith’s base—like the leaks in the basement and the splintering interior ramp purportedly marbled over by the developer—signaled that something was amiss. Within weeks, the Millennium would be surpassed in height by the ascending Salesforce Tower and 181 Fremont. But on that day, it was still the tallest building in SoMa, a flashy heavyweight champ draped in architectural awards. High within were the lairs of luminaries like Giants outfielder Hunter Pence (Pablo Sandoval, too, before he decamped for the Boston Red Sox). The late venture capitalist Tom Perkins lived in the penthouse with a steel Minotaur statue, and below were people who had served as a U.S. ambassador, or written a treatise about voting machines, or counted Kimye as friends. As Pat headed out for her walk, a TV reporter posted outside the main door asked if she would talk about the leaning tower of San Francisco. He added that the homeowners association (HOA) didn’t want people talking to the press. Pat’s ears perked up. “I’ll call my attorney,” she replied, and with that she dialed her husband of 34 years, Jerry. Anyone who has an image of downtown high-rise dwellers as reclusive elitists cloistered from the civic fray surely hasn’t met the Dodsons. Pat, a vivacious 71-year-old, had been the director of casework for Representative Nancy Pelosi’s San Francisco office. (“Do what Nancy would want you to do” remains a guiding principle.) Jerry, a 69-year-old contrarian with a crown of gray curls, made a career as a government litigator suing U.S. Steel and the coal industry, and later took on Genentech on behalf of the University of California (billing up to $1,100 an hour in private practice, which helped finance the couple’s taste in real estate). Both are attuned to the value of the right press at the right moment, and they weren’t about to be squelched by the building’s resident power structure, or anyone else. So Jerry gave Pat the go-ahead to tell the TV reporter whom they see as the primary culprit: the building’s blue-chip New York developer. “The Millennium Partners did not build to bedrock, and that’s the cause of the problem,” Pat stated into the microphone, no nonsense, her bob neat, collar protruding from under her jean jacket. “They will lose in any court, I believe, if they fight this.” By “this,” she was referring to the new focus of Jerry’s in-home law practice: suing Millennium Partners on behalf of himself and allied residents. After the TV appearance, the Dodsons quickly became the go-to public face of the building, offering a counternarrative to that of the developer and a contingent of more than 140 fellow residents who have opted to direct their legal rancor at the tower’s next-door neighbor, the deep-pocketed, taxpayer-subsidized Transbay Joint Powers Authority. The TJPA has poured billions into building a terminus for California’s high-speed rail project—an aspirational Grand Central Station of the West—which, Millennium Partners charges, has “recklessly” undermined the soil beneath the tower, causing the skyscraper to sink and lean and setting countless parties on a collision course of blame, scorn, and litigation. This question of who knew what and when is at the heart of the inquiries that are now roiling City Hall and occupying an army of lawyers and engineers up and down the state. And it’s opening the door for a political power play that’s likely to reverberate for years to come. On the afternoon of September 22, Supervisor Aaron Peskin lifted a packet of papers to his graying mustache with a theatrical flourish in his City Hall office. He gave it a deep, suspicious sniff. The ink was still wet, the paper warm. “These have just been printed,” he said, playing the sleuth in a 58-story mystery series unspooling nightly on the news. The temperature of the document roused the lawmaker’s suspicion because the man presenting it to him—Tom Hui, director of the city’s Department of Building Inspection (DBI)—had failed to mention the existence of this seven-week-old report during several hours of persistent grilling earlier that day at a Board of Supervisors hearing. And yet here it now was, hot off the presses. Recounting the incident one day later at a North Beach café, Peskin chuckled at the ridiculousness of the moment. Although, in a deeper sense, he wasn’t laughing. “This is getting to where somebody calls the FBI,” he said. “This ain’t funny.” Peskin’s suspicions of official misconduct start in the office of the DBI and trickle upward, perhaps all the way to the upper echelons of City Hall. These suspicions are not yet backed by hard evidence or (so far, at least) anything that one could construe as a political smoking gun. But Peskin does have a letter penned in 2009 by then–DBI deputy director Raymond Lui—a document that, in mid-September, the supervisor blew up to poster size for a televised press conference. In this letter, Lui grilled the Millennium’s engineer of record with eight separate queries regarding the building’s “larger than expected settlement.” Before the first luxury condo had been sold, the Millennium had already sunk 8.3 inches and counting, more than the 4 to 6 inches that originally had been predicted by the developer’s engineers for the building’s entire lifetime. “That, Mr. Lui, is quite the letter you wrote,” Peskin told him at the September hearing. “What got you to write it?” Lui calmly said he could not recall. Despite clear evidence that DBI higher-ups had approved a building they’d been warned was sinking, the department’s representatives maintained that their on-the-ground inspectors hadn’t actually detected any sinking—and no higher-up appears to have clued them in. As the denials piled up at the hearing, dozens of Millennium residents seated in the Board of Supervisors chambers murmured and shook their heads incredulously: The “worst-kept secret in town” had eluded the two groups who could have benefited most from learning it—building inspectors and condo buyers. Instead, in August 2009, the DBI green-lit the building to begin sales. Moving trucks packed with Minotaur statues were soon pulling up out front. On a Monday morning in September, Jerry Dodson rushed into the Millennium’s 42nd-floor elevator and zoomed down to “L.” He’d gotten an urgent email from a tower neighbor who was being blocked from entering an HOA press conference on the ground floor. (The HOA claimed that the meeting was only for the press.) There, a clutch of reporters was listening to geotechnical engineer Patrick Shires as he explained how, at the behest of the HOA and the developer, his company was boring three holes down to bedrock to test how the soil was settling under the Millennium. Only the homeowners association has the legal standing to sue for construction defects of the entire building, which could force a fix. The state of the soil—how it’s compressing, and where—is an important clue to what’s going on and why. Arriving, Dodson was also blocked from entering the room by the press conference’s handlers. (“I wasn’t planning on attending the damn thing until they told me I couldn’t attend,” he says.) To him it seemed like more secrecy from a board that had been rebuking his calls for transparency for months. Residents elect the members of three different “baby boards” governing different levels of Millennium Tower; those boards elect members to the Millennium Tower Association, known among residents as the “Center Board,” a nonprofit corporation that makes building-wide decisions and has a fiduciary duty to the building’s homeowners. Yet the Center Board hadn’t been telling members everything it knew: Residents weren’t informed that the HOA had hired Shires to look into the settling back in 2014, or that Millennium Partners had made a presentation to Shires and the Center Board about settlement issues in June 2015. It would be nearly another year before all residents got notice of a special meeting for homeowners on May 10. The 100 or so curious attendees were asked to sign a nondisclosure agreement before Shires explained to them that the homes that many thought were the city’s gold standard were tilting and sinking. After the September press conference, Shires and the HOA’s hired spokeswoman, Evette Davis, led the media outside to where a drill was boring down into the sidewalk, pumping displaced water out of the SoMa earth like a turbocharged chocolate fountain. Soon a scrum of reporters drifted over to another free-flowing source of information: Jerry Dodson, tucked into a doorway, holding forth in full prosecutorial mode for 40 minutes regarding everything that stunk about how Millennium Partners and the HOA were handling this. All the while, Davis stood off to the side, her brow furrowed with evident displeasure. Dodson’s conflict with the HOA had begun long before reporters were on hand to document it. At his first meeting serving on the association’s legal committee in the fall of 2014, he recalls, he heard a “mild allusion” to a problem with the building. Dodson demanded documents analyzing the building’s stability, he says. The acrimony escalated once the settling was officially revealed to residents in May 2016, at which point Dodson began voicing what would become his refrain at such meetings: that the board needed to hire a construction defect attorney, someone who would look at legal action against the developer itself. “Over and over again, in private and public meetings, I was told to shut up,” he says. The Dodsons have many defenders in the building—one of them, who prefers to remain anonymous, calls them “our champions”—yet the pushback from other residents has made their “vertical neighborhood” no longer feel so convivial. “People are upset about the Dodsons because they’re unilaterally doing their own thing,” says one resident. “But the things they’re saying in the press affect everybody. This is not just their own house.” The backlash is the reason Jerry told a reporter not to take photos during a private tour through the tower’s Club Level dining room, gym, movie theater, and wine cellar. To be quoted in the press was one thing, but to be seen traipsing through the halls with a journalist was another. “I am so controversial in this building,” he later said. It was a tense affair for the developer—all the more so because, two hours earlier, he’d been hit with a subpoena from City Attorney Dennis Herrera. “I have serious concerns that the disclosures required by state law”—three-inch-thick binders distributed by the developer to buyers like the Dodsons prior to finalizing sales—“did not contain information about the settling of the property,” the city attorney wrote. The closing line of Herrera’s press release noted, significantly, that the investigation was being led by his Complex and Affirmative Litigation Unit. This indicated that the city attorney had an interest in suing the developer on behalf of the people of California, as former city attorney Louise Renne did with Enron in 2001. The city attorney, it seems, may be more eager to enter into a legal firefight with the developers of Millennium Tower than many of the tower’s own residents. At his press conference, Jeffries stated—truthfully—that many large buildings in San Francisco don’t reach bedrock, and that his tower and its foundation conform to city codes. But he did not divulge that Millennium Tower is the tallest residential structure west of the Mississippi and, crafted of poured concrete, may be the heaviest, too. Concrete is both cheaper and far heavier than steel (the price of which can fluctuate sharply) and affords developers a chance to maximize the bang for their buck. Rather than requiring three-foot gaps between floors as steel structures do, concrete buildings require only a foot-wide slab. You can, lucratively, cram more units into a building this way—Millennium Tower features 58 stories in a 645-foot-tall structure; steel-framed 555 California, by contrast, is only 52 stories tall despite its 779-foot height. The weight adds up, though: One city structural engineer estimates that Millennium Tower may carry the bulk of a 150-story steel-frame building. When plans for the Millennium first landed at the Department of Building Inspection in 2002, fairly little new high-rise construction had sprouted downtown in 20 years. Nearly every building followed the voluminous building codes, which include the recipes for the city’s iconic Victorians as well as the first iterations of New York–style high-rise living. Even through the ’90s, high-rise development continued to cling to the old-money havens of Nob and Russian Hills and Pacific Heights. The “good buildings” were stately places like 2006 Washington Street, whose residents can peer behind the bush that encases Danielle Steel’s Spreckels Mansion. Sans in-house rocket scientists, Chiu called in outside experts for detailed analysis on 80 Natoma. After a full peer review of the building, its foundation, and the soil, Chiu wrote that the experts had determined that “the building could settle an alarming and unacceptable 9–11 inches.” Based on the result of this peer review, the DBI halted the project. (Following a lawsuit, the city eventually purchased the property—which sits above the right-of-way for the proposed path of the high-speed rail tunnel—for $58 million.) For the Millennium—essentially across the street—a similarly rigorous peer review panel was not convened to evaluate the soil and foundation under the tower, and instead largely focused on its aboveground elements. For certain parties, however—most notably Supervisor Peskin—the Millennium fiasco also presents an opportunity. For the ambitious parliamentarian, this is a chance to wade deep into city building rules (his happy place) while, in the words of one City Hall fixture, “looking like Eliot Ness.” As an added bonus, he gets to cause grief for some of his least favorite entities: rapacious developers, the spendthrift TJPA, and “Oh, by the way, it doesn’t hurt that it causes pain for Gavin Newsom,” notes a veteran political operative. At his first Millennium-themed press conference, Peskin issued a “very serious allegation”: that a decade ago “there was some level of political interference” with DBI officials. And yet nobody has solidified the charge that then-mayor Newsom or anyone in his inner circle leaned on the DBI to grant Millennium’s approvals. DBI insiders, in fact, claim that top-down pressure is applied less overtly. The Mayor’s Office “will never tell you, ‘You must sign, no matter what,’” says a longtime department staffer. “They say, ‘Hey! This is an important project. Can you put this guy closer to the top of the list?’” Like deep beneath the ocean, pressure at the DBI is amorphous, constant, and exerted from all sides. “There is always some pressure,” admits 29-year department veteran Hanson Tom—who testified that the “deficiency” in city strictures that allowed the Millennium to skimp on peer review ultimately inspired him to tighten the rules (by which time the tower was both ascending toward the heavens and sinking into the earth). Still, even without rock-solid evidence of political interference, Peskin has navigated into a target-rich environment. He’ll get credit for whatever malfeasance or ineptitude he uncovers and dodge criticism for whatever he doesn’t. He’ll also be acting as an avenging angel on behalf of wealthy tower dwellers, who could be a useful asset if he chooses to run for future office. “If 20 percent of what Peskin is alleging is true, [the media] will report he saw it coming,” continues the operative. Whether or not the city will be forced to strengthen its building codes—and some developers hope Peskin’s crusade will force just that—the Millennium meltdown will create new demands from buyers. “People who can afford to spend millions on condos are going to ask [about going to bedrock]—and if they don’t, their attorneys will,” predicts a condo developer. City structural engineers have long pined for a safety rating of sorts, something that discerning types could use to determine how sound a building is. Skeptics predicted it’d take a good-size earthquake to jolt people into thinking this way. Now maybe it won’t. As for the Millennium, realtor Joseph Lucier of Sotheby's International Realty, who has clients residing in the tower, thinks the problems will hurt the resale of midsize units, of which there is ample inventory throughout SoMa—but likely won’t affect the highest-end units. “There’s only so many penthouses in San Francisco,” he says. “And when you get into that category of individual, I don’t care how nice they are, there’s a bigger-than, better-than sense to their assets.” Also, penthouse seekers are all-cash buyers, so banks refusing to lend on the properties is a moot point for them. Lucier figures that ultimately the tilting and sinking—when fixed—will become a blip in the building’s history. “If the Transamerica sunk and tilted in 1978, and it was fixed by ’81, would that deter a tenant now?” he asks. But that seems a distant hope for the people still inside. Casselman, the TJPA-suing attorney, says one of his anxious clients already sold at a loss and moved out. The Dodsons had hoped to pass on their unit to their adult son, but now, Pat says, “I won’t let him spend the night.” More than 150 homeowners have sought property tax reassessments—with some reporting the value of their property as $0. His insouciance doesn’t seem to be shared by many. Numerous residents don’t think they have two years, let alone decades, before the building’s systems begin failing: The elevators may tilt out of alignment; the plumbing may burst. So incensed is Nina Agabian, a UCSF professor who lives in the building, that she wrote a Chronicle op-ed demanding that the city halt Millennium Partners’ other S.F. construction project—the 47-story luxury condo tower and adjacent low-rise housing the future Mexican Museum—as an incentive to force a fix. The Dodsons are keeping the pressure on. After crashing the HOA’s press conference, Jerry invited a TV reporter up to his condo for a sit-down interview. The newsman had an idea: With the camera recording, Dodson placed a few golf balls on his living room floor. One by one, they rolled to the northwest. In San Francisco, the luxury condominium market has slowed down, yet still looks bright. Every year since 2012, the overall average sales price has increased year after year, according to Sotheby’s. However, in the second quarter of this year, the average sales price year-over-year for condominiums dropped 2.2%. The average sales price for a condominium in the second quarter of 2016 was $1.29 million compared with $1.36 million in the second quarter of 2015. Still, properties like 181 Fremont—the city’s new super premium development —continue to emerge. And it’s not unusual to see expensive materials worked into the interior design of these developments, as well as unique and value-adding amenities from private lounges, clubs, upscale libraries, and fully-equipped gymnasiums. Concierges, often available 24-hours a day, are typically standard and ready to assist residents in myriad ways. 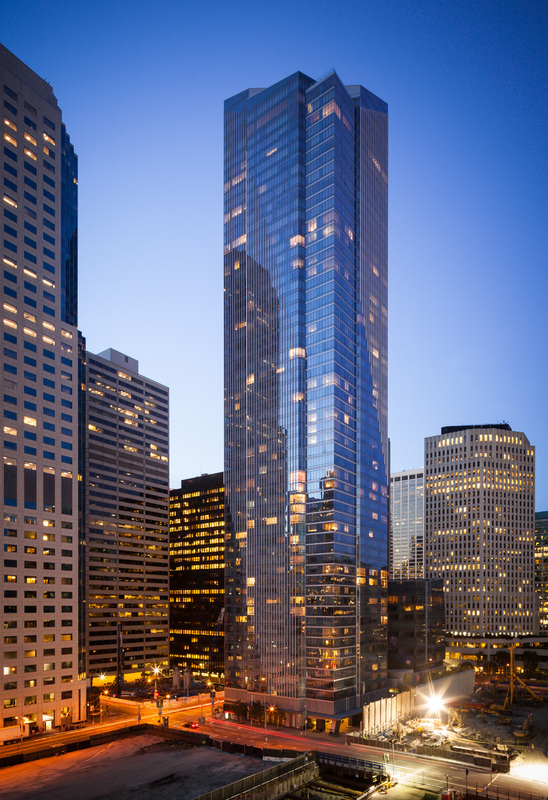 181 Fremont is the most premium building that has come to the market in San Francisco, period. Serving as what will likely be designer Orlando Diaz-Azcuy’s swan song, according to Joseph Lucier of Sotheby’s International Realty, residences start on the 54th floor of the mixed-use building. Luxury condos occupy the top 17 floors of the 801-foot tower, which annexes to the forthcoming Transbay Transit Center. There, residents will not only find 11 different transit systems but also a 4.5-acre rooftop park. Views include the elevated park and the SoMa cityscape on the lower floors, and sweeping views of the Bay Bridge, San Francisco Bay, and Treasure Island from the upper floors. Inside, rich and luxurious materials are ubiquitous, like marble from Italy, wood from New Guinea, and brass door handles from France. Sales opened to the market in May, and construction is set to complete in 2017. Amenities stand front and center at the Harrison—from personal grocery shoppers to Uncle Harry’s, an exclusive residents’ club with live entertainment. The residential building stands at 49 stories and is perched upon Rincon Hill, giving it considerable elevation above the water and views of the Bay Bridge and San Francisco Bay. Detailed and layered Old World design are featured in the residences, common areas and amenities, thanks to interior designer Ken Fulk, who notably designed Facebook executive Sean Parker’s lavish wedding in Big Sur. Sales for one-bedroom and two-bedrooms are underway now, and three-bedrooms are not yet available. The Pacific is the first luxury doorman building to be constructed in the neighborhood in over 30 years. Individual units are bound to feel spacious with 11.5-foot ceiling heights, floor-to-ceiling windows, and views of Alta Plaza Park. Residents have the option of choosing between standard apartment dimensions, or for an even homier vibe, residents can spring for townhouses with three levels or three bedrooms from the row house collection with additional baths. Outside, plenty of restaurants and shops are a half block away on Fillmore Street. Sales of townhouses began late last year, and units in the main building began selling earlier this year for move-ins later this year. Apartment sizes: One-bedroom, two-bedrooms, three-bedrooms, three-level townhouses, four penthouses and four two-level grand penthouses. The penthouse collection homes come as custom shells with no framing, drywall, fixtures, or flooring. Rarely does a recently restored San Francisco home that has not been gutted and completely modernized come on the market. Enter the six-bedroom, six-bath Victorian-style home on the 1800 block of Jackson Street in Pacific Heights. The 6,650-square-foot property is filled with original detailing such as wood paneling, beamed ceilings and a number of unique windows. But the home is modern where it counts, said Sotheby's International Realty agent Joseph Lucier, who, along with Caroline Kahn Werboff of Hill & Co., is listing the property for $4.995 million. The home was built in 1895 for Henry Lund, a native of Germany who served as royal consul for Norway and Sweden on the West Coast. To build the home, Lund hired William H. Lillie, a sought-after architect in the 1890s.The home, which occupies an oversize lot, was renovated by its current owner with help from interior designer Susan Clark. It features custom Grace Richey Clarke window coverings and Lefroy Brooks faucets, as well as a modern kitchen, an upstairs library, a top-floor media room and a lower-level guest suite with a kitchen. "The principal level has been restored to its original grandeur," Lucier said. "And painstaking effort and care was given to the mahogany and oak woodwork throughout the entry foyer, living room and dining room. The original mantel in the living room and the built-in sideboard in the dining room are representative of the craftsmen that were commissioned when the house was built." There is also a south garden that includes tall ferns, Japanese maples, a stone terrace, a large, level lawn, decks and a three-plus-car garage.The front of the home features large London plane trees and an expansive front deck and shelter that are set back from the street. In the entryway, there is a marble stairway, an intricate mosaic-tile landing and mahogany double-front doors that open to a grand hall with quarter-sawn oak floors. On the main floor, the living room is accented by mahogany details, as well as linen walls, a fireplace, a glass chandelier and oak flooring. The front library, which has a fireplace, is currently used as a formal dining room. A large carved oak buffet and fireplace highlight the family room. There is also a deck off the family room. The kitchen holds marble counters, wainscoting, white subway-tile backsplash, Wolf range, stainless steel Sub-Zero refrigerator, two dishwashers and built-in La Cornue French rotisserie. The second level has a staircase with a LaFarge stained glass piece that sits over a window seat and a Juliet balcony at the top of the stairs, as well as a copper leaf ceiling over the second-floor landing. The entry hall, complete with candle sconces, leads to a remodeled bath with marble tiles and a bathtub with a rain shower. The master bedroom suite comes with a fireplace and a walk-in closet, as well as heated marble floors, double sinks, a soaking tub and a separate shower. The third floor features two bedrooms, one with a balcony and skylight, five closets and a bathroom with an antique bear-claw tub. A media room with skylights and star lighting is adjacent to the card room and deck. There is also a wet bar with a storied marble top, which was quarried in the 1930s and originally used in a post office. The bar has a nickel sink and custom fixtures.The lower level holds a living area, a kitchenette and French doors that open to an expansive deck with Ipe wood. "The home has an elegance that conjures up images of San Francisco during the turn of the century," Lucier said. "Being in the home, you can imagine the large-scale entertaining that went on in the home - particularly in the dining room - which could have easily held a table for 25. There's also a sense of privacy and comfort with the ... house being situated back from Jackson Street."